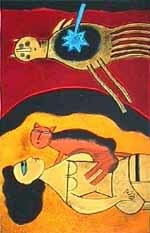 Corneille (Cornelis Guillaume van Beverloo) was born in Liege in Belgium in 1922, but of Dutch ancestry. 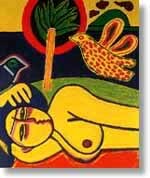 Corneille studied art at the Academy of Art in Amsterdam, Holland. 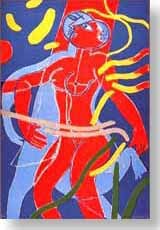 He was one of the founders of the REFLEX movement in 1948 and in 1949 he was also one of the founders of the COBRA group in Denmark, which has had great influence on Scandinavian art. His work is exhibited in all major museums of modern art in the world. Corneille died in 2010 at the age of 88 years. On the next page, the gallery also exibits terragraphs on canvas.